The Nike Air Flightposite 2014 arrives in white, game royal and team orange, which is a sneaker famously worn by Allan Houston during the 2002 season while playing for the New York Knicks. Featuring a white-based upper with royal and orange accents, these kicks make their comeback for a 2014 redeux. Act fast, these will be flying off shelves quick. It’s still all about how you Own It. So getting right for this upcoming Spring is a must. 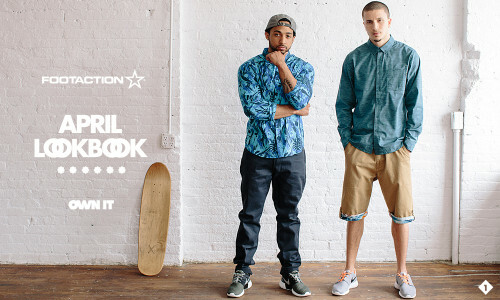 Fresh for the Spring, Footaction has you covered on all bases. From Nike SB button ups to Hustle Gang tanks, you’ll be able to stay cool in any weather. Asphalt Yacht Club always holds it down when it comes to cutting edge design, but the consistency of Jordan Brand tanks are a must for any Spring closet. Whether you chose to rock with the lightness of the Nike Roshe or the vibrant colors of the Adidas ZX Flux, your feet will always be the topic of discussion. Topping off any sick fit with the right New Era Cap always adds more points to your overall score, but these crispy new Standard & Grind shorts can make any pattern pop. We’re still in a stupor from the festivities of last weekend in New Orleans… it was memorable to say the least! From experiencing immersive retail locations to styling NBA Stars with Rachel Johnson, we’re going to chalk it up as a “W”. After looking through all of the footage we shot, we decided to relive it one more time for the books. Enjoy the video recap that we put together for an overhead view of Footaction’s 2014 NBA All Star Weekend. The ’90s served as a period for glorious invention and reinvention of Nike Basketball footwear. Bold experiments in style and innovation brought us classics, with staying power. Perhaps, no sneaker better captures that sense of nostalgia than the Air Flightposite – a former hardwood classic turned urban staple that teeters the line between street and tech. Meant to mirror a carbon fiber finish, the silhouette’s upper stays true to tonality with a range of black-on-black materials. No detail has been sacrificed to maintain the look and feel of the original. 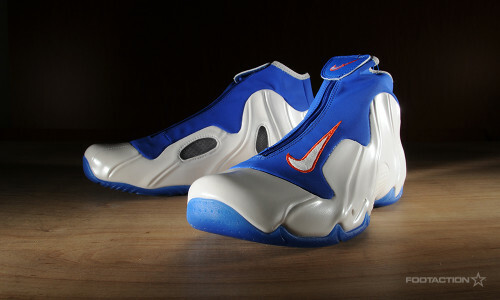 The lone contrast comes in the form of two white Swooshes on the heel and shell; both of which were featured on the same colored Air Flightposite model in 1999. The Nike Air Flightposite 2014 “Black/Metallic Silver” drops tomorrow, Saturday,February 22nd at Foot Locker, House of Hoops by Foot Locker and Footlocker.com (starting at 8:00 a.m. EST) for $ 210. Check the Launch Locator to see which stores will have this release and let us know if you’ll be copping in the comments. NBA All- Star Weekend is always a movie and this year in New Orleans was no different. As Footaction constantly brings its A-game every year when it comes to special partys and in-store installations, we may have outdone ourselves this year with the white and gold store on Bourbon and Canal. Perched at the beginning of the infamous French Quarter, the Footaction store was given a complete makeover into an exclusive All-Star Jordan Brand experience. Not only could you cop the latest All-Star kicks, you could customize them with laces and other small accessories. Next door to the store featured a talk from both Blake Griffin and Carmelo Anthony’s stylists. They gave tips on style and also answered a few questions from the curious audience all while exclusive Jordan Brand apparel spun around on a golden carousel in the middle of the darkly lit space. 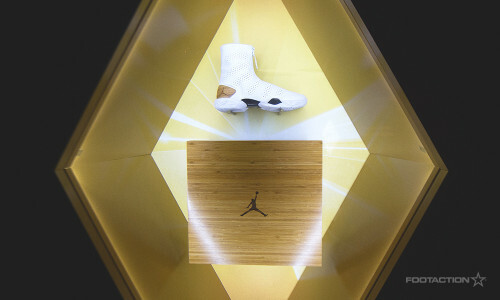 Inside the walls in brightly lit glass cases were even more exclusive Jordan Brand sneakers including the extremely clean “Bamboo” XX8s and the yet to be released “woven” Air Jordan XIs. adidas had a store of their own in the Esplanade Mall Footaction that also featured exclusive Adidas footwear and apparel that could be customized to your liking. However it wasn’t until we stepped into the Jordan Flight Lab were we really blown away. Fit with smoldering smoke and laser lights, the entrance to the Jordan Flight Lab was something out of a Steven Spielberg movie. Upon entering, we were quickly ushered to a dark room that featured a small basketball court and a gigantic screen. Holographic builds of players like Chris Paul and Russell Westbrook would show anyone who was brave enough to step on the court some of their signature moves. And if that wasn’t enough, the last room of the Jordan Flight Lab featured a customization center in which you could build your own custom Air Jordan but only a few were lucky enough to receive them. All-Star Weekend never fails to disappoint if you’re a true sneakerhead, so if you haven’t made you way to ASW yet, you may want to book your flight in advance this year! Take a look at the pictures above to relive the incredible experiences this weekend. All-Star Week is here! Along with all the great basketball festivities that will be taking place this week, it is also one of the most anticipated sneaker release week’s of the year! We have a great lineup on tap headlined by 2014 Nike NOLA Gumbo League Collection, Nike Basketball’s tribute to the unique flavor of New Orleans. The collection includes three shoes: LEBRON 11, KOBE 9 Elite and KD VI. A “gumbo” in the cultural sense, New Orleans is an eclectic mix of characters, music, cuisine and art. Inspired by the flavors and stories of the Big Easy, Nike cooked up a bold mix of technical innovation, aesthetic flair and old-fashioned New Orleans traditions for some of the world’s best basketball players: LeBron James, Kobe Bryant and Kevin Durant. In partnership with mall management, SELECT Foot Locker and House of Hoops by Foot Locker stores will implement a sweepstakes ticket procedure* in order to purchase the Nike NOLA Gumbo League Collection: LeBron 11 “Gator King” ((on sale 2/14/14 for $ 220) Kobe 9 Elite ‘Maestro’ (on sale 2/14/14 for $ 225) and KD VI “Illusion” (on-sale 2/14/14 for $ 150). The sweepstakes tickets will be given out Tuesday, February 11th and Wednesday, February 12th. If your ticket number is selected, you will be notified by phone on Thursday, February 13th. These procedures are for SELECT STORES only. To find out which store near you will carry the shoe and if that store will implement the sweepstakes ticket procedure, please visit the Foot Locker Launch Locator. These releases will all be available on Footlocker.com starting at 8:00 a.m. EST on Friday, February 14th. Inspired by the fearsome alligator, the king of the bayou, the LEBRON 11 Gator King is a bold expression of royalty and power. Gators, often a symbol of protection in New Orleans culture, influence graphic textures throughout the shoe. Invisible to the naked eye, hand-drawn patterns come to life as the Hyperposite bucket of the shoe glows in the dark. The musings of majestic color in deep purples, greens and gold are derived from the “Rex” – king of carnival celebrations. Nike Basketball pays tribute to the masters of Jazz in its birthplace. Like great jazz musicians who play instinctively, Bryant brings a similar improvisation to his game. Paying homage to this classic genre and some of its greatest musicians, the KOBE 9 Elite Maestro uses accents of brass in the upper. A glow-in-the-dark outsole pops at night, just as the jazz clubs swing into action. The upper includes additional, secret glow-in-the-dark symbols. Not everything is what it first appears to be in New Orleans. Similarly, Durant defies the perception of a near seven-footer – an illusion of sorts. His limitless scoring range is redefining the perception of a forward. Celebrating the magic of KD’s versatility, the KD VI Illusion showcases hand-drawn patterns on the upper emulating Durant’s fluidity on the court. 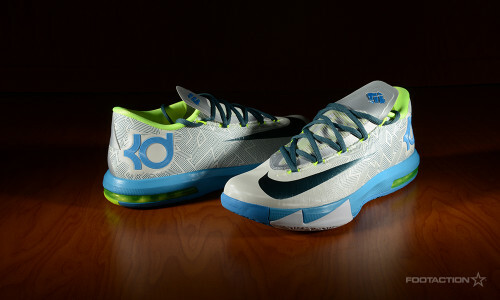 A glow-in-the-dark outsole also represents the “spark” of KD’s game. The Nike Air Max 2014 is the latest introduction from the famous Air Max franchise, and it looks like the Swoosh is sticking to their guns. These bad boys are an evolution of the original Air Max 1, which was the first shoe to feature visible air and revolutionized the athletic footwear industry. The brand has been focused on innovating their approach to the Air treatment through the decades so it’s a new shoe every time. 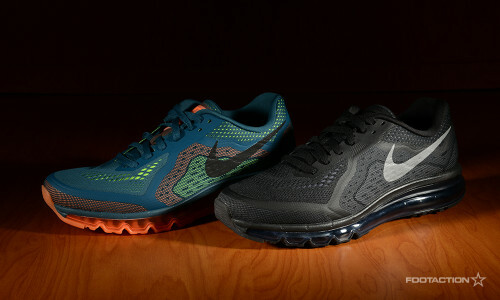 The newly unveiled Nike Air Max 2014 boasts a lightweight, Engineered Mesh upper, which is paired with a lightweight foam and seamless overlay that conforms to the shape of the foot to provide support/structure for high-level performance. They come in two colors: black/stealth and blue/crimson, and you see the images in the slideshow above. Athletes – Who Will #OWNIT in 2014? Looking back at the past 12 months in sports, we’ve some stars develop, some stars unfortunately battle through injuries and some young athletes break into the national spotlight. For the year ahead, this is whole we’re keeping our eye on again to revisit at the end of the year. Fresh off of college football national championship just a few days ago, Winston led the Florida State Seminoles to an undefeated 2014 season. At the tender age of 20 years old, all eyes are on Winston this year. Is this the year that Kevin Durant finally surpasses the #2 spot? Kevin Durant has been runner-up time and time again since he arrived in the league (and was the second overall pick in the draft), he hasn’t quite been able to pull of winning a championship. Yet. Peyton’s change of organization from the Indianapolis Colts to the Denver Broncos solidifies the fact that the man can play the game of football. It almost seems as if he’s getting better with age. When you’re frequently the center of talks about if you’re the greatest player in NBA history, or better than Michael Jordan for that matter, you’re going to be on this list. To LeBron, he still has more to prove so as fans we’re excited to see what he’ll accomplish in the future. The most explosive and feared runningback in the National Football League, Adrian Peterson is working harder than ever to push the Minnesota Vikings further than have gone in the past. “Megatron,” as Calvin Johnson dubbed, is absolutely a monster and a pure weapon for Detroit’s quarterback Matthew Stafford. So fast yet so tall and with incredible athletic ability. Before the college football season started, everyone’s eyes were on Johnny Football and now that the season is over, he proved to everyone why he received those eyeballs in the first place. Manziel is the real and somehow surpasses some people’s expectations of his talent. Still undefeated. Still as confident as ever. 45-0 and a Las Vegas mainstay. Probably the most slept on athlete on this list. Kevin Love can shoot, defend, rebound and pass, and he does it all well. He’s one of the most versatile players in the NBA and arguably the most versatile big man in the league. These two are on the list because they both went down with unfortunate injuries shortly after returning from being out indefinitely. Two of the most electric and exciting all-around threats on the hardwood are missing and we’re rooting for them. These are our ten. Which athletes on your list this year? Brands – Who Will #OWNIT in 2014? When the conversation came up about listing off the future of what the notable brands, it became more about the excitement of looking at what these brands will release next versus predicting what they’d do. At Footaction, we live and love the brands we carry. Each one has their own notable story that they’re consistently telling and we can’t get enough. Most importantly, they’re creating products that we enjoy. So with that said, we chose a handful of brands and highlighted some of sneakers we’re really digging at the moment. Trends – Who Will #OWNIT In 2014? In our second installment of The Footaction 50, following up a post on Artists & Musicians, we’re looking closely at the trends that were massive in 2013 and how we think they might evolve, adapt or progress this year. Although not a list of chronological order, but rather more of a laundry list, these are the things that you should keep your eye on. Style playing an even larger part in artist’s personas. More artists that similar to A$ AP Rocky and Theophilus London. It’s safe to say that style and the way that these artists dress plays a large part in their individual brands. They move, breathe and live fashion just as much as their music. It seems to them that it’s all one in the same. Expect more artists and creatives to be emerge and be cut from the same cloth in 2014. The NBA try new types of jerseys and possibly taking it too far. On this past Christmas Day, we saw the NBA unveil an alternate jersey (even if it was a special Holiday edition) and we’re still questionable on it. Although the league will only be switching it up for certain days out of the 82-game season, it still might take some getting used to. The kicker, however? They’ll be having nicknames on the back of jerseys for some games — and that’s too XFL for our taste. What are your thoughts on this? Late Night Television hits refresh; gets younger. The news of Jimmy Fallon taking over Jay Leno’s show and bringing it to New York City for the first time in four decades, while Seth Meyers takes over Fallon’s old show means that we’re seeing a major transition in mainstream media. Late night talk shows are defined by some of entertainment’s most memorable personalities and this change will be surely exciting to witness. New delivery methods for full-length projects by artists and musicians. These past three years, we’ve seen Kanye West shake up the game with his Good Friday releases — where he’d release one new song every Friday leading up to his album My Beautiful Dark Twisted Fantasy which shook up the game. Then last year, Jay Z partnered up with mobile company Samsung to sell a million copies of his album to reach platinum status even before it was released for his Magna Carta Holy Grail album. Then, most recently, Beyoncé released her self-titled album Beyoncé without any promotion, no radio single and placed the album on iTunes. We’re excited to see how artists will continue to shake up the game this coming year. Mobile phones, the Internet and technology. It’s now more normal than ever to have a cell phone and Internet access and many of the systems that our parent’s knew and dealt with have gone through major disruption in the past few years. It’s incredible. Technology is revolutionizing the concept of identity (Facebook, Path), changing the payments world (Square, Bitcoin), democratizing media and news (Twitter) and adapting to new ways to communicate (Snapchat). However, we’ve merely scratched the surface. Also: no hoverboard yet. 40 is the new 20. Maybe this isn’t a trend we actually believe, but can we talk about how Pharrell still looks the same as when he was 20? The term “trend” is how something changes and develops in a general direction, and although his age count is increasing, he develops into more proof of the fountain of youth. Let’s just pretend this one was never brought up. The Quantified Self. With apps & wearable technologies that measure your life for wellness, health and productivity such as the Nike Fuelband or the Jawbone Up, it will be interesting to see what more metrics can be measured to better our lives. As long as it’s not Google Glass. The “Selfie.” No secret that the “Selfie” has taken it’s a way into mass culture with the use of Instagram and Snapchat. If these companies are worth billions of dollars and most of the content posted on them are selfies — well, you’ve got a powerful trend happening on your hands. The Quantified “Selfie.” Pro-tip: the selfie game is real and you should be getting on the level of these guys at the Selfie Olympics. Okay, not really.